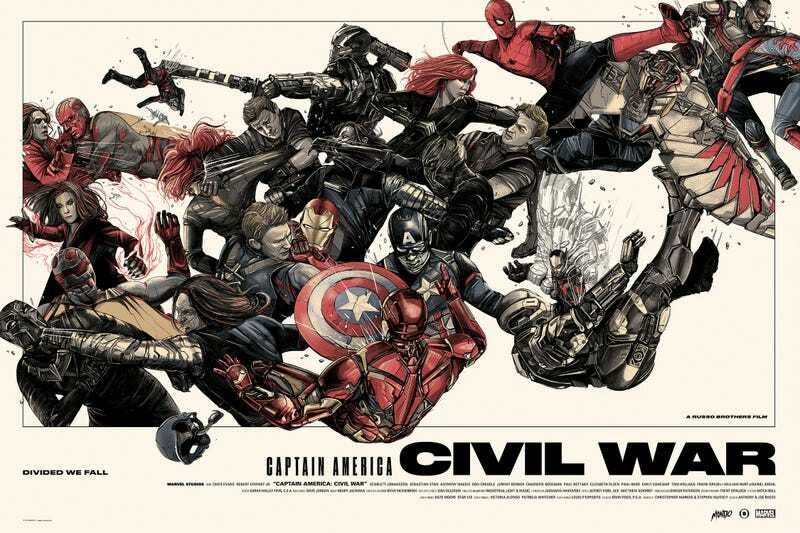 Oliver Barrett’s new Mondo poster for Captain America: Civil War is just one of almost 20 new posters and variants to celebrate 10 years of Marvel Studios. The Mondo Gallery in Austin, Texas just opened its doors and revealed Marvel Studios: The First Ten Years, a massive gallery show featuring brand new posters spanning the first decade of the Marvel Cinematic Universe. The show consists of 11 new posters, along with six variants, for Iron Man, Thor, all three Captain America films, both Guardians of the Galaxy, Doctor Strange, The Avengers, and Spider-Man Homecoming. If you’re a fan of the MCU, even if you don’t love these posters, you’ll be amazed at what that team has accomplished in the last decade. Now, while you can’t buy these just yet (unless you happen to be at the Mondo Gallery in Austin, TX where they’ll be on display through October 20) many of them are likely to make it online. Anything that doesn’t sell out at the gallery with end up on their site and you can get news of when that’ll happen by following @MondoNews on Twitter.